Products of the domain : Château Aney. The vineyard was created in 1850 by Mr ANEY and will always keep the name of its founder. The estate now has 30 hectares of grape with a vineyard of Cabernet Sauvignon (65%), Merlot (25%), Cabernet Franc (7%) and Petit Verdot (3%). The vineyard is located at Cussac-Fort-Médoc, between Saint-Julien and Margaux, in a fabulous terroir, typical of the Médoc terroirs, with gravelly soils where nature has brought together climatic and geological conditions ideal for the development of Vine. This superb vineyard is now owned by the Raimond family and since 1972, which respects a tradition of responsible viticulture and a classic winemaking, with a barrel aging. Very nice domain to discover. 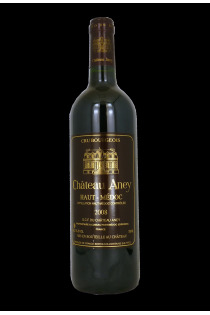 Haut Médoc Cru Bourgeois - 2008 - Château Aney.